Lufthansa luggage allowance. Find out Lufthansa baggage size and baggage cost, plus carry-on policy before you fly. 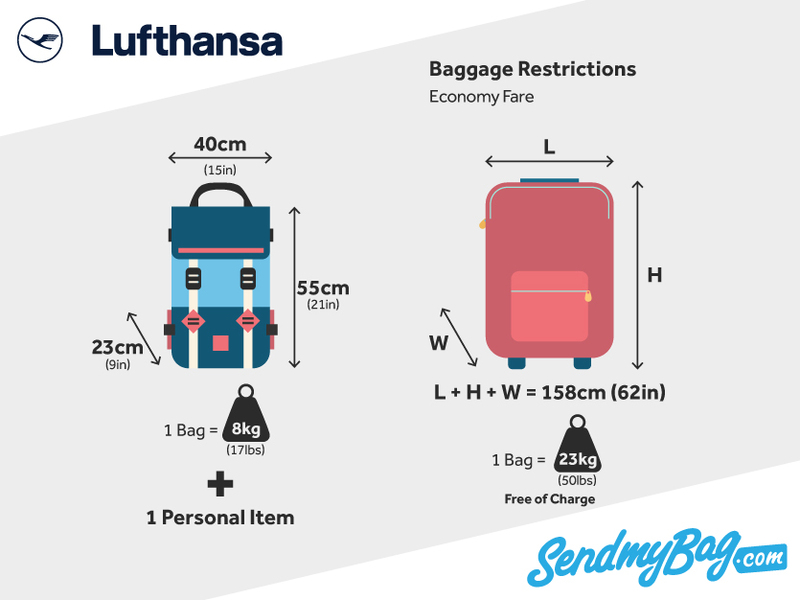 If you need to take more luggage with you than Lufthansa's luggage allowance permits, why not send your luggage to your destination and avoid the hassle of dragging bags through the airport and onto public transport? Find out just how affordable it is to send your luggage with Send My Bag. 1 cabin bag (Economy/ Premium Economy) or 2 items of cabin baggage (Business/ First), each with a weight of no more than 8 kg/ 17 lbs. Passengers may also carry on as hand luggage a smaller personal item, such as a handbag or laptop bag. If needed, passengers may also carry on board either a carry cot, pushchair or child seat for infants, and any required mobility aids, such as a wheelchair. The Lufthansa carry-on baggage size is 55 x 40 x 23 cm/ 21 x 15 x 9 inches; or 57 x 54 x 15 cm/ 22 x 21 x 5.9 inches for foldable garment bags. The permitted dimensions for the personal item are max. 40 x 30 x 10 cm/ 15 x 11 x 3.9 inches. Economy: 1 x 23 kg/ 50 lbs; Premium Economy: 2 x 23 kg/ 50 lbs; Business: 2 x 32 kg/ 70 lbs; First Class: 3 x 32 kg/ 70 lbs. Bags may measure up to 158 cm/ 62 inches in total (width + length +depth). No bag may exceed 32 kg/ 70 lbs in weight, for health and safety reasons. Oversized bags are charged at EUR 100/ USD 150 on flights within Europe or EUR 200/ USD 300 on intercontinental flights. Overweight bags are charged at EUR 50 / USD 70 within Europe or EUR 100/ USD 150 on intercontinental flights. Both oversized and overweight bags incur a charge of EUR 150/ USD 220 within Europe or EUR 300/ USD 450 on intercontinental flights. Note that fees will be higher if additional pieces of luggage are also oversized and/or overweight. Lufthansa have introduced Economy 'Light' fares on transatlantic flights to North America. This cheaper fare means that passengers can travel with carry-on luggage only. Alternatively, they can choose to add an item of checked luggage for a fee. Looking for Lufthansa sized hand luggage?